The real estate sector faces a host of challenges that will require professionals in all facets of the industry to become more adaptable and agile in the coming years in order to remain relevant and competitive, according to a newly released report commissioned by the National Association of REALTORS®. Concern about the erosion of the importance consumers place on real estate professionals in structuring and managing transactions in an era of fast-moving technology is among the top issues cited in the study, which is based on data from a national survey of approximately 7,800 REALTORS® and interviews with 74 high-level executives and other real estate industry leaders. The report also takes other real estate-related studies, reports, articles and surveys into account. Another challenge for the industry is the arrival of companies that previously did not participate in real estate, which could disrupt established business models, according to the study, known as the D.A.N.G.E.R. Report (“Definitive Analysis of Negative Game Changers Emerging in Real Estate”). Concerns about uneven professional standards and the burdens posed by government regulations also are on people’s minds, the report says. The report was conducted by industry analyst Stefan Swanepoel, head of the Swanepoel T3 Group, a research and consulting firm, at the direction of NAR’s Strategic Thinking Advisory Committee. It is divided into five sections that detail challenges facing agents, brokers, NAR, state and local REALTOR® associations, and Multiple Listing Services. The arrival of newcomers looking to introduce consolidation and new business models to real estate is another issue the industry faces, he adds. Michael Oppler, senior vice president at Prominent Properties Sotheby’s International Realty and one of the 20 at-large members of the Strategic Thinking Advisory Committee, called the report a peer-to-peer dialog tool. “When you look at this report, you can have a much more open and honest conversation in your office,” he says. 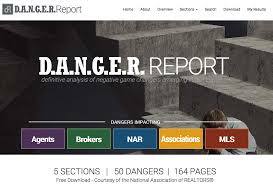 Click for DANGERreportMay2015 (1) and discuss the issues in your office so that solutions to these looming problems may continue to be explored. New Mortgage Rules Start August 1st! Simpler For Buyers- More Work For Lenders.